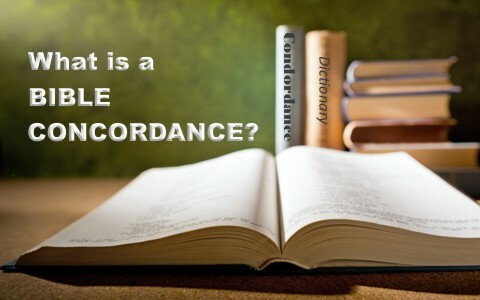 What Is A Bible Concordance? How Do You Use One? What is a Bible concordance? Is it necessary? Should you be using one? A Bible concordance is an alphabetical listing of biblical words which gives reference to particular Bible verses that directly relate to whatever word is looked up. For example, if you looked up the word “grace” in a Bible concordance, you’d find verses like Ephesians 2:8-9 which gives a precise definition of grace. The concordance will also give Scriptures where a certain word is used, like again with grace, it will list Ephesians 2:8-9 because the word grace appears there as it does in Hebrews 4:16, 1 Timothy 1:14, and so on. When you are studying about certain topics like faith, you can look in a concordance and write out every one of the Bible verses where the word faith is found and do a thorough study on that subject since there are hundreds of verses with the word faith in them. Do you need a Concordance? We all are commanded to grow in the grace and in the knowledge of our Lord (2 Pet 3:18) and since we find this knowledge about Jesus Christ in the pages of the Bible, we must study the Word of God in order to know more about the Word of God (John 1:1, 14). If you are concerned about false doctrines and ministers of Satan, called “angels of light,” look up the word “false” in your concordance and see some of the warning signs that accompany those who are bringing another gospel, which is really no gospel at all (Gal 1:7). The FBI has staff who studies fifty and one hundred dollar bills for hours at a time so that they can immediately spot a counterfeit when they see one. The best way to spot a counterfeit gospel is to know the original so well that you can spot a counterfeit one from the genuine thing. Your standard is the Bible. By the way, some Bibles have concordances in them, usually in the back. You can do your own Bible study, create one, or dive into a subject that you’ve always wanted to know more about. Use your concordance. That’s what it’s there for. That is a highly subjective question because it depends on who you ask. I like Strong’s concordance but others like Young’s Exhaustive Concordance all have their advantages. The difference between an exhaustive concordance and any other concordance is that exhaustive concordances are supposed to have every word in the Bible listed. An exhaustive concordance will exhaust you with info but if that’s what you want, it’s best for you. For others, a concordance that focuses on the main subjects like repentance, faith, grace, mercy, and so on is sufficient. These are normally enough for most of us but again, it depends on how deep you go. There are dozens of exhaustive concordances on the Internet too. It really speeds things up for those who want to know now! Some, like those in the back of your Bible, will even give a page number where the verses can be found in your Bible. If it’s in a separate concordance, you’ll see a list for every book in the Bible where the word is found which you were studying for. Sometimes there is part of the verse that is written with the word being in lower case, as in “a” for angels. I hope you are able to understand the usefulness of a Bible concordance by now. It is very handy to have one when you need help with a difficult Scripture. When we find similar Scriptures and read them next to the difficult one(s), in some cases it can shed light on the meaning of it. For sure, we have to study to show ourselves approved unto God but Bible study can also help us grow in the grace and knowledge of our Lord, Jesus Christ. Since the goal is to be Christ-like, we need to like His Word and a good Bible concordance can be a beneficial resource and an exciting learning tool that can be used to equip you for your labor of love for Christ and for His glory.